Just your friendly fill-in host here again with a brief recap in reverse. 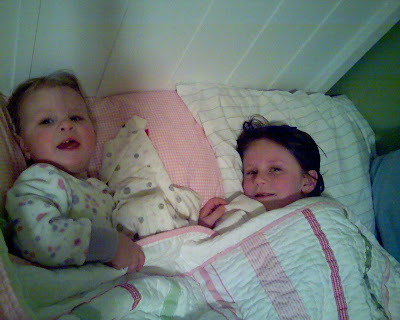 The day ended with these two little girls snuggled in Suzy's bed. Isabella requested the sleepover concept so good ol' Dad obliged so here they are - livin' it up. When I turned out the lights Isabella started singing to Suzy and within minutes the little one was fast asleep - what a pair. The boys are having a sleepover in the master bedroom with me tonight but I don't think that there will be any singing - unless I break out with the "Lumberjack Song" or something along those lines. We received a lovely invite to my brother's house tonight for a swell haystack dinner. Dad and Mom G were also included in the festivities. We got a firsthand look at the new baby G (still gestating) room which turned out very nice indeed. The sis-in-law has a good eye for paint color and what not if you ever need a decorator. And brother Jon (the facilitator) can paint a mean stripe or two when needed. Jack stayed home from school today after complaining that "everything hurts". He likes to use aches and pains to his advantage sometimes - like when it comes to lunch time and the food in front of him isn't so appealling he says, "my neck hurts, I think I better eat a donut instead of these green beans". That was paraphrased but you get the point. This morning Grandpa G picked up Jack and took him to breakfast at the Essenhaus (where they had donuts of course) and then he was going to just take him to school - but Jack complained of pains in the head and neck region so Grandpa brought him home instead. These kids are lucky to have Grandparents that are involved. This morning I got up on the wrong side of the bed since my wife wasn't here to sleep on that side. Usually she wakes up on that side so in her absence I thought that I would give it a try. It actually sleeps pretty good over there - except for when someone cries from the downstairs bedroom at 4:00 a.m.
Well, that sums up life here in the fast lane where we will do it all over again tomorrow. Hats off to all you stay at home types that do this every day. I have said it before and I'll say it again, "This is the hardest, most demanding job there is". I am the biggest proponent of Moms being at home and Dads going to work for many reasons - not the least of which is that I'm not sure I could handle this day in and day out! I guess that's why God made us differently and equipped us each to do our gig (which for me would be going back to work on Monday). Sorry about the sappy, soapbox moment there - now I'm gonna go sing the "Lumberjack Song" while I scratch myself. What a dad...Sounds like you have everything under control! I would call it a controlled chaos there Kimmy. Hey Don - I was just catching up on these blogs, and have been wiping tears of laughter off my face! Must be the "Yoder" in you. ;) Don't tell Heather, but I think you should keep on blogging - better yet, start your own and name it Mr. Shlub. (is that what you called yourself?) Kind of like Mr. Rogers - all you need is a nice cardigan and penny loafers. What a great dad & awesome hub! Love ya!